Initially, whales’ ancestors resembled small deer, with four toes, each one ending in a small hoof. One particular fossilized “missing link” found in India suggests that the last whale precursors took to the water in times of danger but came onto land to give birth and eat. They would spend considerable time wading in shallow water, foraging for aquatic vegetation and invertebrates, and eventually small fish and amphibians. 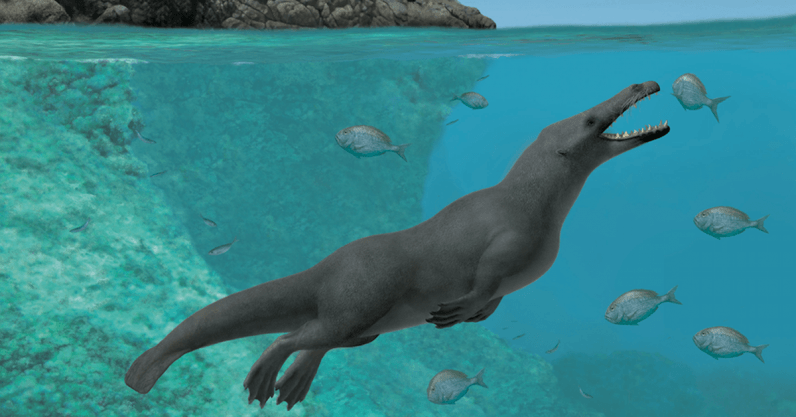 Around 42 million years ago, and still land-worthy, the newly discovered Peregocetus pacificus set off on an epic journey to the other side of the world. In the Middle Eocene era (roughly 48 to 38m years ago), Africa and South America were half as far apart, but that is still an impressive swim for an animal less than three meters long that was not completely adapted to marine life. This article is republished from The Conversation by Jan Hoole, Lecturer in Biology, Keele University under a Creative Commons license. Read the original article.